At Edison High School, several motivated students are taking part in the Global STEM Challenges Program. The 90 participants come from a variety of economic backgrounds. WASHINGTON — Did you know you can use part of a cellphone as a lens to magnify things? Some local 14-year-olds who were challenged to build a portable, affordable microscope figured that out as part of a science, technology, engineering and mathematics (STEM) education program. 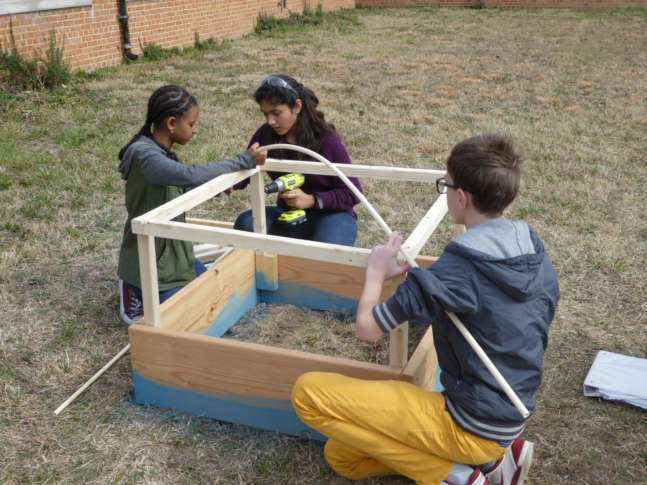 “It was phenomenal what the students built — phenomenal,” said Pamela Brumfield, principal of Edison High School in Alexandria, Virginia. “They didn’t have any of this when I was in school,” Brumfield chuckled. “We’re super excited by what these kids are going to be like by the time they become juniors two years from now. Students at Edison are working in the Global STEM Challenges Program, which gives them experience solving real-world issues. “It’s hands-on. In most classes you’re taught to learn it and you’re not applying it to anything, so it doesn’t stick,” said Francis Reyes of Springfield, who will be a sophomore this fall. The project allows students to work independently and in groups within teams focused on specific goals. The only requirement for students to be considered for the program at Edison is completing algebra I in middle school and filling out an application indicating interest. The 90 participants are diverse and come from a variety of economic backgrounds, Brumfield said. Edison is the first school in Fairfax County to participate in the Global STEM Challenges Program. “We hope to expand upon it by 2018-19 to open more opportunities like this across the school system,” said Scott Settar, Fairfax County Public Schools’ program manager for technology and engineering education and STEAM (science, technology, engineering, art and mathematics) integration. The success of the project and whether it will be expanded, Settar said, will be judged by Standards of Learning (SOL) test scores from January of the student’s sophomore year. “We believe it’s not the true measurement of the success of a program, but one of the things we are held accountable to in Virginia is the Standards Of Learning assessment,” Settar said. Settar, Brumfield and Reyes discussed their experience with the program at the Global Grand Challenges Summit, held in D.C. this week. The summit was jointly organized by the U.S. National Academy of Engineering, the U.K. Royal Academy of Engineering and the Chinese Academy of Engineering. “The aim of this is international cooperation to see how we can solve some of the biggest issues of our time,” said Randy Atkins, program director for the National Academy of Engineering Grand Challenges for Engineering. If you look at the last century, Atkins said, the world has been completely transformed by engineering that led to electrification, the automobile and the airplane. And in the next century, who knows? “We’ve identified 14 grand challenges for engineering that we think can change the world if they’re accomplished,” Atkins said.